Let’s be honest. It was beginning to look a lot like Christmas when CVS put out their red and green holiday candy two weeks before Halloween. Retail stores are always anxious to bring on the holiday shopping. But if there was ever a year when we needed a little Christmas right this very minute, it’s 2016. Oh, to return to our childhood: My six-year-old’s biggest concern is that she’s been informed that Santa can’t bring her the American Girl kitchen set, which costs $250 (!!). Santa believes dolls shouldn’t have more expensive kitchen tools than adults. We hope these specials get you in the holiday spirit as you shop, cook, write cards and deal with guests who stay too long. Here, in chronological order, are our picks for the 12 holiday specials you can’t miss. Let someone else do the dishes. After the huge meal, settle down with your family to watch PBS’s new version of the beloved 1908 novel. Martin Sheen stars as Matthew Cuthbert, the man who, along with his sister, raises the orphaned Anne (Ella Ballantine). Any fan of The West Wing knows there’s something innately comforting about watching Sheen. In honor of the 50th anniversary of this holiday special, NBC is airing the full 26 minutes—it won’t be trimmed as it has been in years past. We all know people whose hearts are two sizes too small, but the Grinch couldn’t take away the Whoville’s joy, and they can’t take away ours either. I’ll admit I’m biased on this one. A Snowy Day, by Ezra Jack Keats, was my absolute favorite book as a child, and it’s one I now read to my children all the time. I was a bit nervous that this new animated special, produced and narrated by Laurence Fishburne, might not capture the magical simplicity of the book. Thankfully, I was wrong. The animation brings the book’s signature drawings to life while fleshing out a very simple story about a boy who loves the snow. Angela Bassett, Regina King and Jamie-Lynn Sigler lend their voices to this soon-to-be classic. How did Sesame Street become the friendliest place to live? In this new special, Elmo and friends go back to the 19th century to learn how Elmo’s great-great-great-grandmonster made Sesame Street such a happy, friendly, and kind street. Zosia Mamet, Audra McDonald and Jim Gaffigan all appear. Another extremely popular children’s book is brought to life in If You Give a Mouse a Christmas Cookie. Everyone knows Mouse can get easily distracted, especially when there are sweet treats involved. Lisa Loeb sings “Christmas Cookie Song” and Amazon is hoping you’ll like what you see: The TV series If You Give a Mouse a Cookie launches next year. Who hasn’t built a snowman hoping he would come to life? This tale from Arthur Rankin, Jr. and Jules Bass never gets old. The 1995 sequel, Frosty Returns, couldn’t capture the sheer magic of the original, but it’s still worth checking out at 8:30. There’s a pure joy in watching this 1964 classic. 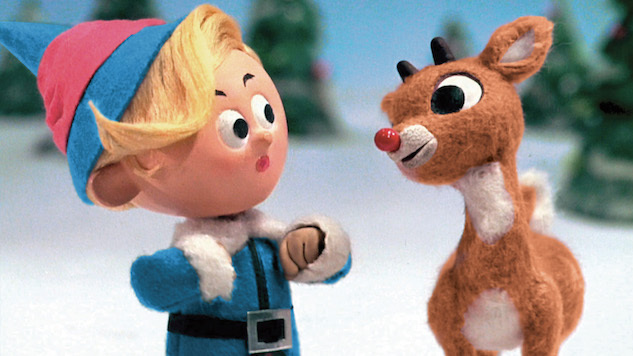 I’ll never tire of hearing Rudolph exclaim, “She thinks I’m cute!” or Burt Ives singing “Holly Jolly Christmas.” But this year the story of a reindeer who is bullied for being different and realizes the thing that makes him different also makes him great takes on a whole new meaning. The always flawless Taraji P. Henson is back to host a holiday special as only the star of Empire can. The special promises songs by Jussie Smollett, Taye Diggs, Pharrell Williams, Missy Elliott, Alicia Keys, Darryl McDaniels of Run-DMC, Snoop Dogg and TLC. Cookie came to play, y’all. It’s the 20th anniversary of TNT and TBS airing this beloved 1983 film. All Ralphie (so wonderfully played by Peter Billingsley) wants for Christmas is a Red Ryder B.B. gun. Will he get one? You’ll have 12 chances to find out. And also to learn never, ever to put your tongue on a frozen flagpole. Amy Amatangelo, the TV Gal ®, is a Boston-based freelance writer, a member of the Television Critics Association and the Assistant TV Editor for Paste. She wasn’t allowed to watch much TV as a child and now her parents have to live with this as her career. You can follow her on Twitter (@AmyTVGal) or her blog .